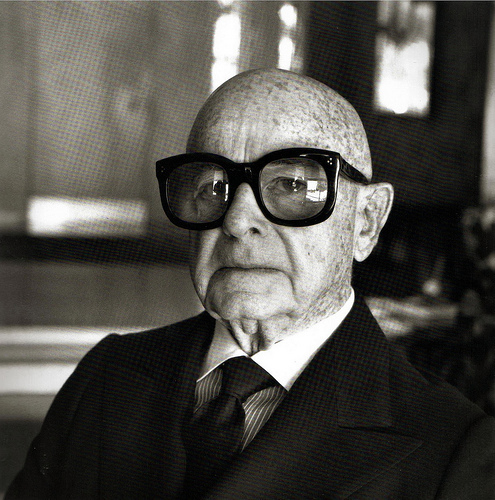 Today is the 110th birthday of Swifty Lazar. I am a sucker for a person in a pair of gigantic glasses (think of Iris Apfel and Carrie Donovan) and in a strange turn of events, my original post about Swifty is the most-visited post I have ever had. This is all due to the Howard Stern Show mentioning him and his glasses and linking to my blog from their blog for visual reference. The world is a better place because he was in it and still feels the loss that he has left. BEST KNOWN FOR: ing Paul “Swifty” Lazar was an American talent agent and dealmaker, representing both movie stars and authors. Born Samuel Lazar in Brooklyn, New York, he graduated from Brooklyn Law School in 1931. While practicing bankruptcy law during the early 1930s, he negotiated a business deal for a vaudeville performer and realized the income potential for acting as an agent. He moved to Hollywood in 1936 but maintained a presence in New York until after World War II when he moved to Los Angeles permanently. After putting together three major deals for Humphrey Bogart in a single day, he was dubbed “Swifty” by Bogart. The moniker stuck but was a name he actually disliked. In addition to Bogart, Lazar became the agent representing the top tier of celebrities, including Lauren Bacall, Truman Capote, Cher, Joan Collins, Noel Coward, Ira Gershwin, Cary Grant, Moss Hart, Ernest Hemingway, Gene Kelly, Madonna, Walter Matthau, Larry McMurtry, Vladimir Nabokov, Clifford Odets, Cole Porter, William Saroyan, Irwin Shaw, President Richard Nixon and Tennessee Williams. Lazar’s power became such that he could negotiate a deal for someone who was not even his client and then collect a fee from that person’s agent. During World War II, Lazar, with Benjamin Landis, suggested to the U.S. Army Air Forces that it produce a play to encourage enlistment and to raise funds for the Army Emergency Relief Fund. The Air Forces commanding general, Henry H. Arnold, agreed and the play Winged Victory was written by Moss Hart and produced by Hart and Lazar. It was a huge success, playing on Broadway and on tour around the U.S. for over a million people. A film version was produced during the same period. Lazar was an executive producer (with Bernie Brillstein) of John G. Avildsen’s Neighbors (1981), starring John Belushi and Dan Aykroyd, and he was an associate producer on two television miniseries, The Thorn Birds (1983) and Robert Kennedy & His Times (1985). He was renowned for his annual post-Academy Award parties that started at the famous Romanoff’s, then moved to the Bistro Garden and finally to Wolfgang Puck’s restaurant, Spago. His was widely regarded as the most important Oscar celebration, and those who received invitations were regarded as the inner circle. Lazar died in 1993, aged 86, from complications stemming from diabetes which eventually cut off circulation to his feet, which doctors wanted to amputate. Lazar, who was being treated at home via peritoneal dialysis, refused amputation. This refusal hastened Lazar’s death. The Death Certificate states “Imminent Cause: Chronic Renal Failure due to Glomerulo Sclerosis due to Hypertension. Other significant conditions contributing to death but not related to cause given in 21 [above]: lower extremities diabetes.” He was interred in the Westwood Village Memorial Park Cemetery in Los Angeles next to his wife, Mary, who had died in January that same year from liver cancer. Michael Korda wrote a 1993 New Yorker profile of Lazar, later incorporated into Korda’s book, Another Life: A Memoir of Other People (Random House, 1999). At the time of his death, Lazar was working on his autobiography, Swifty: My Life and Good Times, which was completed by Annette Tapert and published by Simon & Schuster in 1995. Swifty Lazar appears as a character in Peter Morgan’s stage play, Frost/Nixon, first staged at the Donmar Warehouse, London on August 10, 2006 and played by actor Kerry Shale. In the play Lazar negotiates a deal with David Frost on behalf of President Richard Nixon for Frost to interview Nixon. The play is closely based on real-life events. He has also been portrayed by Toby Jones in the 2008 film version of Frost/Nixon.